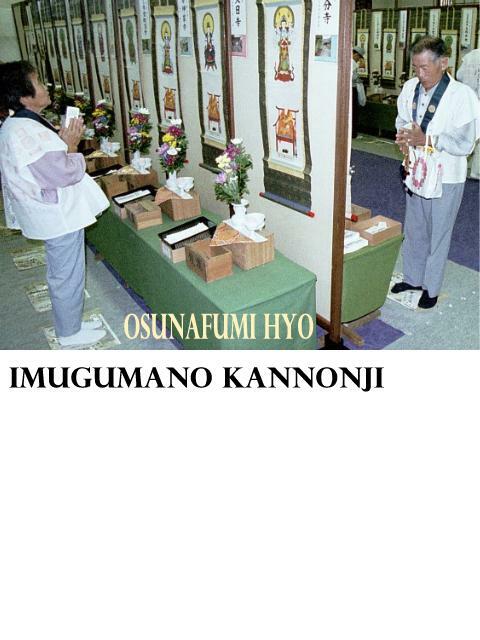 Imagumano Kannonji is the 15th temple of the 33-temple pilgrimage of Kansai. According to the Lotus Sutra, Kannon appears in 33 different transformations in order to perform the tasks of salvation for living beings. Kannon literally means watchful listening, and is often translated as the one who sees and hears all. This is indeed the task of the compassionate Kannon Bosatsu, to witness and listen to the prayers and cries of those in difficulty in the earthly realm, and to help them achieve enlightenment. In the Imagumano Kannonji temple visitors can make a symbolic pilgrimage by stepping over sand squares one by one. Sand for this Buddhist ceremony has been collected from 88 different temples in Shikoku. For many people the sacred pilgrimage is not possible due to various reasons. So the representatives visited the temples on behalf of them and brought back suna (sand) from each temple. If the believers step on the sand and pray gods they can get the same divine favour as actual visiting of those temples. 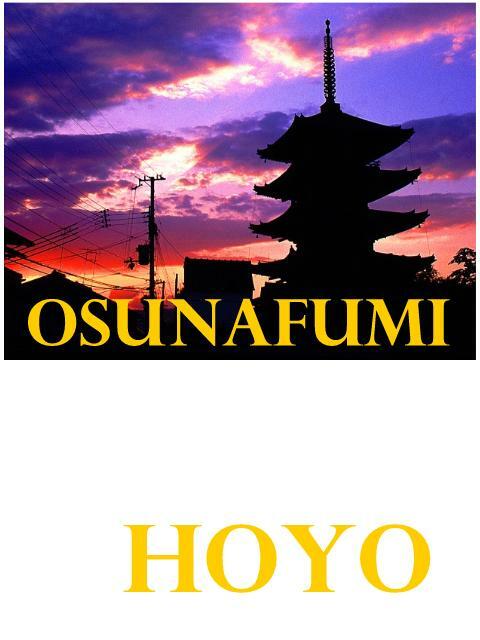 Osunafumi Hoyo (stepping sand memorial service) started in 1827 and many people have been visiting the Imagumano Kannonji from all around the western area of Japan. 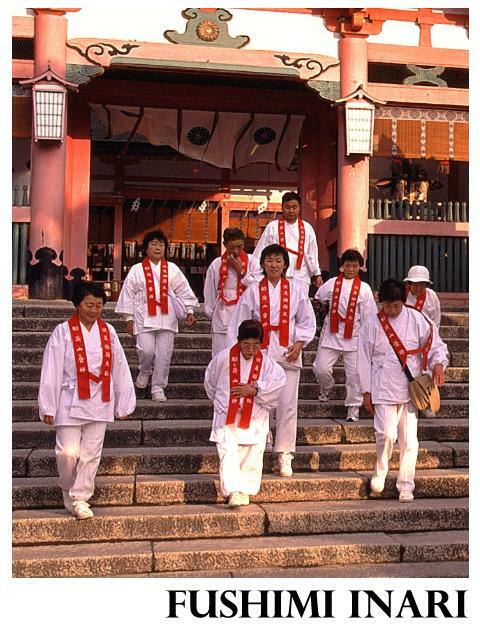 Many kinds of instant pilgrimages are possible in Japan. In Hagyu temple (Niihama, Ehime), there is sacred sand from Lumbini, Bodhgaya, Sarnath, and Kusinagara in India, and also sand from Seiryu temple of Chang-An in China. Lumbini is the sacred place where Shakyamuni Buddha was born. In Bodhgaya he attained enlightenment after long meditation. In Sarnath Shakyamuni preached his first sermon, and in Kusinagura he entered nirvana. The Saikoku Kannon Pilgrimage to 33 temples in Kansai was founded in 718 by the monk Tokudo Shonin. Later the popularity of the route led to its replication, and over 230 copies of the route spread throughout Japan. Of these, the Bando route is considered the most important after the original Kansai pilgrimage. The Bando Pilgrimage in Kanto was designated in 988 by Emperor Kazan when Kannon Bosatsu appeared to him in a dream, saying "I have divided into 33 bodies throughout the eight provinces of the Bando area, and a pilgrimage to these 33 sites will bring release from suffering." Later, both the Saikoku and Bando pilgrimages were formally linked to a third circuit, the Chichibu Pilgrimage (Saitama area) to 34 Sites Sacred to Kannon, making a complete circuit of 100 sites (Hyakuban Kannon Fudasho). Making the circuit to each in proper order (Saikoku, Bando, Chichibu) is said to save the believer from hell and to open the gates to everlasting life. The Shikoku Pilgrimage (Shikoku Hachijuhakkasho) to 88 temples honours the Buddhist saint Kobo Daishi who was born on Shikoku in 774. By doing this route, the pilgrims can be released from having to go through the cycle of rebirth. Why the pilgrimage includes 88 temples? The first theory is that this corresponds to the number of delusions in people and the world. By visiting each of the 88 temples, you eliminate one of these delusions at each temple. By walking the pilgrimage, you obtain absolution and by the time you finish the pilgrimage you have cleansed yourself. The second theory says that the number 88 is the sum of the unlucky ages (yakudoshi) of men, women, and children. When one reaches one of these special years, certain special religious practices need to be performed to guard against bad luck and other potential misfortunes. The most dangerous are 42 for men, 33 for women, and 13 for children of both sexes. The total of these ages is 88. Other explanations have also been offered. The number eighty-eight represents a multiple of eight, the number of great sacred Buddhist sites in India. The three characters used to write the number 88, when combined, make the character used to write the word for rice. Kukai, as Kobo Daishi is also called, is credited as a father of Japanese culture. A renowned poet and scholar, he is said to have invented hiragana phonetic writing system for Japanese. In China he was introduced to esoteric Buddhism. Kukai entered China in 804, but returned to Japan in 806, two years short of his scheduled 20-year study period. Because of this, he was not allowed to enter Kyoto, and was said to have had stayed in Dazaifu, Fukuoka Prefecture, for about two years. At first Kukai became disillusioned with his studies. The ructions with the Otomo clan left him without a highly placed patron which dimmed his career prospects. Kukai went through a decisive transformation while at university that led to him abandoning his studies and becoming a wandering mendicant. Mendicants were despised by the government and the aristocracy, so Kukai could hardly have been seen to fall further. There are about 3,000 folktales and legends about him told all over the country. No other person in Japan has ever commanded such devotion. The name comes from a story about a miracle that happened when Kobo Daishi visited a temple and decided to do a seven-day ritual. During that week, a young girl came every day and brought him food. When he finished, he went to her hut to thank her and to beg for some cloth to mend his clothes. He only asked for a couple of small scraps, but she gave him enough fine, hand-woven cloth for a new priest's robe. He thanked her and asked how someone so obviously cultured and skilled came to be living all alone in a hut in the mountains, far from the capital. Her mother was a lady of the court and father a guard. Shortly before she was born, the father was exiled for rebellion and the mother, fearing some danger to the baby, prayed for guidance from Kannon. The prayer was answered with advice to go to Shikoku, where she brought up her daughter until she died, leaving the girl alone, as she was when Kobo Daishi met her. Inspired by the story, Kobo Daishi carved a statue of Senju Kannon, the form of Kannon with 1,000 arms symbolizing the infinite ways this Bodhisattva reaches out to help those who call for her help. The girl then asked Kobo Daishi to cut her hair and make her a nun. He did. Instantly, a rainbow-coloured cloud came down from the sky and the girl attained Buddhahood, changing into a statue of Kannon. Kobo Daishi then took the two statues and enshrined them in the temple, which he founded in her honour. 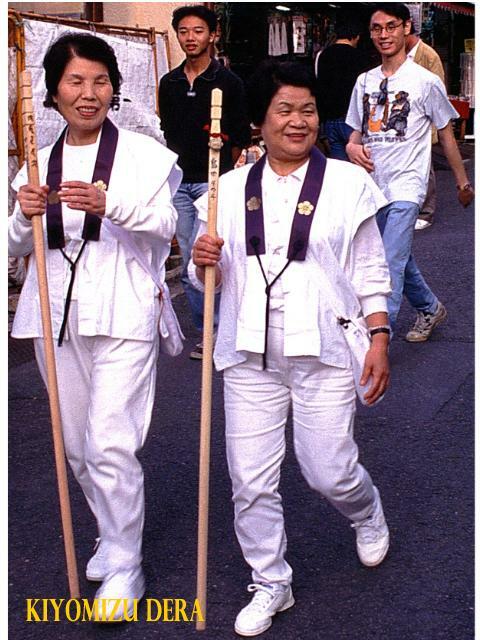 Until the time of Kobo Daishi, most Japanese Buddhists believed that women could not attain Buddhahood. They thought a woman had to first be re-born as a man. This is one of several stories about Kobo Daishi that supports a view found clearly in his writings that everyone can become a Buddha "in this very body." Long time ago there was a man called Emon Saburo. He was very rich, but all he wanted was to be richer still. One winter day a wandering monk came to his gate, prayed and held out his begging bowl to appeal for food. Saburo coldly refused him. Next day the same monk came again, but Saburo angrily drove him away. The monk kept on returning. On the 8th day Saburo struck him with a stick, dashing his bowl to the ground. The monk came no more. But on the next day the eldest son of Saburo died, and the next day another. Eight days passed, and every one of his eight children was gone, to his grief and horror. Saburo then realized how wrong-headed and evil he had been. What he had to do, he determined, was to go and find that holy man and beg absolution. Soon he was following the monk's trail, asking for alms, begging for food himself every day. He went around and around Shikoku Island for four years, but in vain. Having already made 20 rounds, he decided to make one more round in the reverse direction, instead of trying to catch up with the monk. His health was failing, but he had to keep searching. On his way to Shozanji deep in the mountains, Saburo fell down, ready to die. At that moment, Kobo Daishi, the monk he had been searching for, appeared before him. The saint, knowing everything, forgave Saburo, saying his sincere repentance had washed away his sins. Greatly relieved, the man was about to close his eyes. Then Daishi asked if he had a last wish. He answered that he would like to be reborn as the lord of Iyo, his home province, to have the power to do great good for his people. Daishi picked up a small stone, wrote something on it, and pressed the stone into the dying man's left hand. Some time later the wife of the Lord of Iyo gave birth to a baby boy whose left hand would not open. They tried everything but they could not open it. At last they called in the head priest of their family temple Anyoji. He chanted powerful prayers and finally the baby's hand opened. Inside was a stone and on it was written "Emon Saburo Reborn."